I recently captured my best-ever chub brace, landing this 5lb 2oz specimen (left), followed by a 4lb 8oz fish while I was setting up my camera! I risked life & limb to land the latter fish, because I was fishing a peg with a very steep - almost vertical - bank leading down to the water. 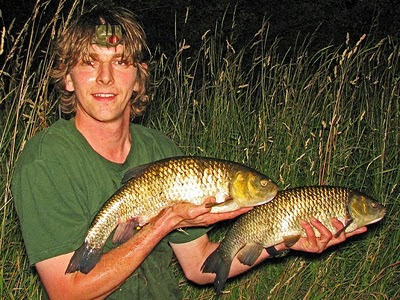 I wanted to rest the chub in my landing net, in the margins, but as this wasn't possible where I was fishing, I took the net and fish a couple of swims downstream where the margins were shallow and calm. As I was setting up the self-timer function on my camera, the alarm on my other rod screamed! I was left to battle the fish in a deep, fast-water peg with no landing net! Standing between me and the net were 3 trees, overhanging the water. There was no way over or around them, so I had to (in the dark), scale the steep bank, test the margin depth with my toe whilst holding onto a tree with one hand and the rod in the other. Luckily there was a narrow, rocky ledge about a foot under the water, so I slowly shuffled along this, negotiated the trees and a reedbed and finally reached an area I knew was shallow, where I jumped in feet-first and managed to reach my net! It's a good job it wasn't a barbel or I may have been waterskiing! I later went on to catch a barbel and another 4lb 8oz chub, all caught on a variety of pellets.